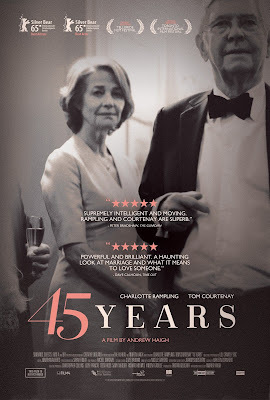 45 Years is the type of film that likes to hold a single, static shot for longer than one might anticipate while simply asking you to bask in it-to soak every moment of it up. It's contradictory to my spastic American mind to take such calming nuances as intentional, but in reality this technique is enlisted to allow audience members to really drink in the subtle, but hugely devastating ideas the film meddles in. It should be noted, I guess, that the main ideas of the film are not inherently devastating, but that more the conditions that can sometimes come along with the institution of marriage are such that we don't consider them until they happen. For a bond that should be built on such trust and assured confidence it is often times shaken by the most delicate of details. 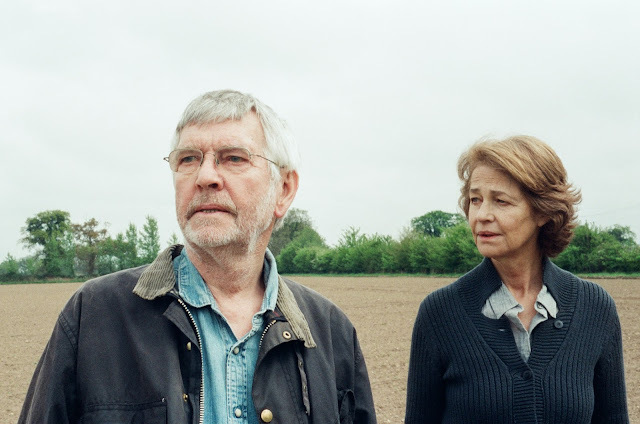 In the case of Kate (Charlotte Rampling) and Geoff Mercer (Tom Courtenay) it is little more than what was once an afterthought to Kate, but decides to come back with a vengeance and reveal it may have been much more to her husband all these years. There is no act that was performed on Geoff's part that violates the sanctity of their marriage, but more something completely out of both parties control that informed the way one half would feel forever and the powerlessness of the other to ever allow him to forget it. In a word-it's heartbreaking. One might even call it cruel, the way fate aligned to bring this couple into each other's lives at the time in which it did, forever setting them on this path where they were more or less destined to fail. This fracture is barely visible in the beginning, though. As we come to know the Mercer's as they prepare for a weekend party that will celebrate their forty-fifth wedding anniversary (hence the title) they live a quiet life in the open countryside of England seemingly enjoying the latter years of their lives. It is the resurgence of old memories and "what might have been" possibilities that throws their relationship into a whirlwind of doubt and vulnerability that at least Kate never saw coming. The odd anniversary number of forty-five is being celebrated because the originally planned party for the couple's fortieth had to be delayed due to Geoff's declining health. Like much of what we learn about these characters, the details are spoken rather than being shown. In fact, much of what makes the film so engaging is largely never shown on screen, but is instead funneled through the performances of Rampling and Cortenay. It is through their dialogue and their body language that we learn the two enjoy a happy, childless marriage with their biggest disagreement being the occasional cigarette Geoff sneaks in the backyard. The film takes the approach of going through this week leading up to their forty-fifth wedding anniversary day by day-essentially breaking the film into six sections that average around fifteen minutes or so a piece. On Monday we learn that Geoff has received a letter informing him that the body of Katya, his former lover, has been found perfectly preserved in a Swiss glacier. As far as we can tell, given the exchange of dialogue that occurs between Geoff and Kate, is that Katya died during a hiking accident with Geoff in 1962. This revelation comes as nothing short of a shock to the ailing Geoff. As he attempts to grapple with this news and the idea of his past making it's way into his future, our attention is directed to Rampling's Kate who deals with this in a way that surprises even her. There is no reason for her, on the surface, to be angry or upset with her husband over one of his ex-lovers, much less one who died before the two of them even met, but the obvious rush of emotions concerning Katya that is seen in Geoff is unsettling to Kate who ultimately finds the event unexpectedly difficult to deal with. in the week leading up to their 45th wedding anniversary. To be up front would be to state that 45 Years is a slow, quiet film that bathes in it's washed out color palette. It is a film that, while paced rather nicely considering it's structure, moves along leisurely while feeding us insight we're not even aware is insight upon initial viewing. The way in which writer and director Andrew Haigh, working from a short story by David Constantine, weaves in these small details only to have them pay off in unexpected ways later reinforces the emotional devastation of the realizations both Geoff and Kate are coming to throughout the course of the film. While one could say the film is about many things, including both several specifics of marriage and of relationships in general, the larger theme is that of the decisions that go into what we spend our precious time on; what we find worthy of investing this sole life in. For Kate, she found solace and a worthwhile experience in what Geoff offered her and no doubt imagined that he felt the same way, but the more she learns of her husband's prior relationship the more false her life begins to feel. And it is largely due to Rampling that the deluge of emotion that falls down upon her are given real credence. Given the serene nature of the tone there is no reason to expect any grandstanding moments from either of these characters, but instead both let things bubble just below the surface before more or less dismissing such complications that feel absurd at this stage of life with direct dialogue and an agreed upon resolution. Rampling conveys this boiling envy she is experiencing solely through the work of her eyes and other key facial features. It is the eyes though, that change her facade from that of an optimistic and comfortable woman to that of a defeated and jealous person who is, more than anything, seething with pain. There's one scene in particular where, after a long day of going into town and talking with friends, the realization comes down that the couple doesn't have many pictures of themselves from over the course of their marriage. Kate largely blames this on the fact they never had children and to have taken photos only of themselves would have seemed vain, but is admittedly disheartening in old age. This minor detail about the choice they made once upon a time to not care about taking pictures has lead to the inability to remember and reflect on certain memories. And once again, in old age, the realization that memories are all we have to truly hold onto rocks the beginning stages of Kate's regret even more. For Geoff, Courtenay gives the other half of this partnership an unsettled attitude as if he can only take so much at once and with the news of "his" Katya the idea of having to also make apologies to Kate is overwhelming. In this aforementioned scene though, the couple begin dancing in their living room to Lloyd Price's "Stagger Lee," after the discussion of photos turns to what each of them would most like to have a picture of. Given this no doubt brings to Geoff's mind that photos are all he has left of Katya he attempts to divert such thoughts by reminding himself of why he fell in love with Kate in the first place. As they dance one says to the other after becoming winded quickly that they're not twenty anymore. This idea of how much time has passed and how much time these two have spent with one another making it's way to the surface. It's a shame, really, because it likely seems to both Kate and Geoff that their twenties were only a few months prior-when getting winded while dancing was the least of their worries. Through this simple line of dialogue the film displays it's characters questioning, in different approaches, if all these years later-was the life they lived the one truest to themselves? Like I said, heartbreaking.